After Rooted in Cheyenne plants a tree, volunteers water that tree periodically for a year, both during summer and, to the surprise of some, in winter. You may have even noticed someone watering your tree this month, even though your tree has no leaves. This is because trees and shrubs need water all year. In summer, small holes in leaves called stomata allow carbon dioxide to enter the plant cells for photosynthesis, after which waste oxygen is released. Because the intercellular spaces inside a leaf are saturated with water vapor, the plant loses water as that water vapor leaks out of the leaves in a process called transpiration. To reduce water loss through transpiration, most plants close their stomata at night when photosynthesis is not occurring. Trees can lose enormous quantities of water each day through transpiration. Native cottonwood water consumption has been measured at more than 20 inches per year1. For comparison, Cheyenne’s annual average precipitation is only about 16 inches per year. During the winter, deciduous trees lose their leaves and become dormant, and water usage drops to nearly nothing. Tree bark largely prevents water loss from underlying tissue. Roots retain stores of moisture and if the roots dry out they can die. In a dry, windy climate like Cheyenne’s, soil can become particularly dry to the point that it draws moisture out of tree roots and causes damage to the tree. For this reason, it is important to maintain good soil moisture around tree roots, particularly for trees that were recently-planted. To accomplish this, it is good practice to water trees about once a month in the winter whenever the temperature is above 40F. A 4” layer of bark mulch also helps hold in soil moisture. Since bark mulch decomposes over time, adding a fresh layer of bark mulch over the tree root zone each fall is a great way to keep the root zone moist all winter. Luckily, bark mulch is available at little to no cost for Cheyenne residents at the City Compost facility on Windmill Rd. 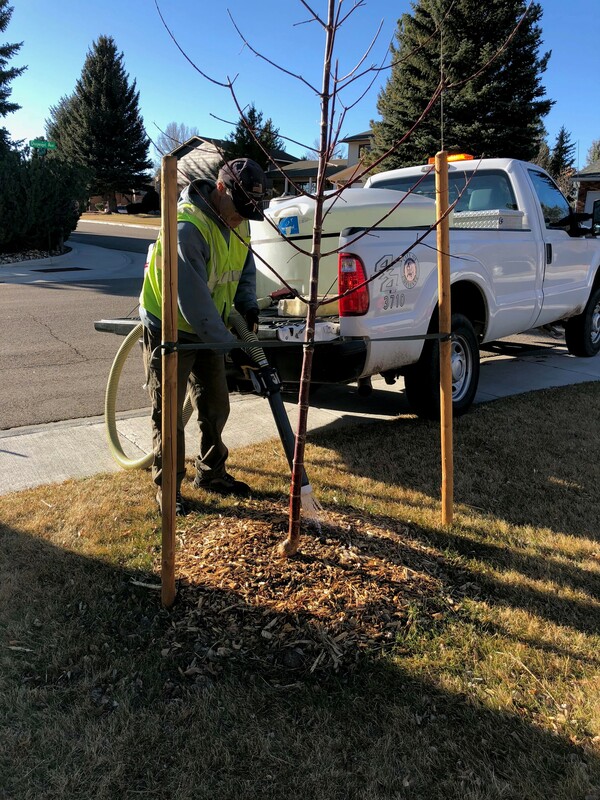 Tree survival in Cheyenne is greatly improved with winter watering and bark mulch. Rooted in Cheyenne will provide these inputs for the first year. Homeowners can enhance survival and vigor of their trees in subsequent years by continuing to winter water and apply bark mulch.